Have you been worried about Windows XP app compatibility in Vista and Windows 7? Is it holding you back from an upgrade? Microsoft may have a trick up its sleeves with Windows 7’s “XP Mode”. Taking advantage of a technology called “virtualization,” which runs one operating system as a “guest” on top of another operating system (the “host”), Microsoft can launch applications and they’ll run using Windows XP, right inside of Windows 7! A beta of Windows XP Mode should be released to developers and partners next week, and to the general public by May 5, alongside the Windows 7 Release Candidate, so you should be able to get your hands on this for a test drive soon. A bit of history: Apple had to do this with “Classic” mode in Mac OS X. It was a kludge, but virtualization technology was in its infancy at the time. Apple’s solution could only share files and, to a limited extent, the clipboard. 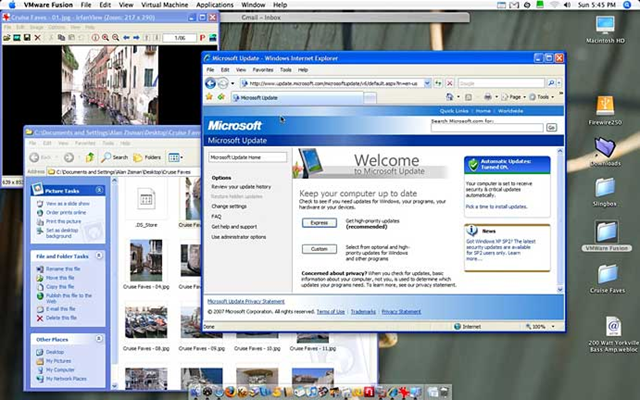 Classic mode didn’t support Mac OS X printers, user settings, and so forth – so it was quite a hassle to run the old Mac OS 9 apps on Mac OS X.
Microsoft, having purchased Connectix, makers of Virtual PC, and given the benefit of time, has learned a lot about virtualization, and has been steadily improving virtualization support in Windows. So will you be able to work with your Windows XP Mode apps just like regular apps running in Windows 7? You shouldn’t have a problem. This is shown to a good extent in “Unity” mode in emulation apps on the Mac like VMWare Fusion and Parallels. This mode runs Windows apps as though they’re running on the Mac desktop, although it’s not perfect, considering the OS differences (see Figure 1 for an example). Windows XP apps should run side-by-side just fine with Windows 7 apps, and you should technically be able to switch between them with no issues. Now, most applications today run perfectly fine in Windows Vista and Windows 7. However, this is a great solution from Microsoft to address the needs of those holding out on upgrading their XP installations due to legacy hardware and software concerns. Some solutions just plain need Windows XP. It’s good to see Microsoft doing something serious about this, rather than just telling everyone to upgrade their software. Yes, Microsoft understands that upgrading software isn’t always an option. No details on the licensing side have been announced so far. This means we don’t yet know if you’ll need both a Windows 7 and a Windows XP license. My guess is you’ll have to enter your old Windows XP license key to “activate” Windows XP mode, and it will just run transparently, like when you use Compatibility Mode in Windows Vista (see figure 2). I’m definitely curious about how drivers will be handled, and where they get installed, and how application installations are managed. There’s a great article by Ina Fried over at CNet, so click here to read that article for more information. Figure 1. VMWare Fusion’s “Unity” mode running Windows and Mac apps on the same Mac desktop. Figure 2. 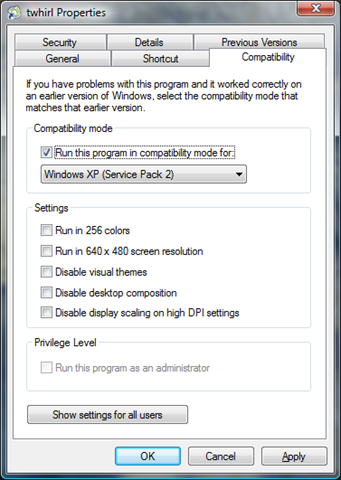 Will Compatibility Mode in Windows 7 be tweaked to run Windows XP in a virtual machine? I hope it’s this easy! Thanks for this! I have stuff that won\’t work on Windows 7 So this would be great! I am assuming this is something different that running Virtual PC and installing your own copy of XP? I\’ll go read your article link to see if it has more info on the licensing of this. I hope it "just works out of the box" as it\’ll only run under the host OS. But this is new to me – and I really appreciate your sharing it! Good news! Good post! Jeffrey: I don\’t know yet. That beta should answer our questions! 🙂 I\’m thinking it will work like the Unity mode I discussed; or, at least I *hope* that\’s how it works. I\’m curious how it will affect startup time. If it\’s a super lean Windows XP, it should come up relatively quick, especially on modern hardware. Processors with built-in virtualization support should help as well. I noticed in Ina\’s article that only Vista Professional and Ultimate were listed. I understand if Microsoft decides the Home edition wouldn\’t get such a feature. Looking forward to trying it out!